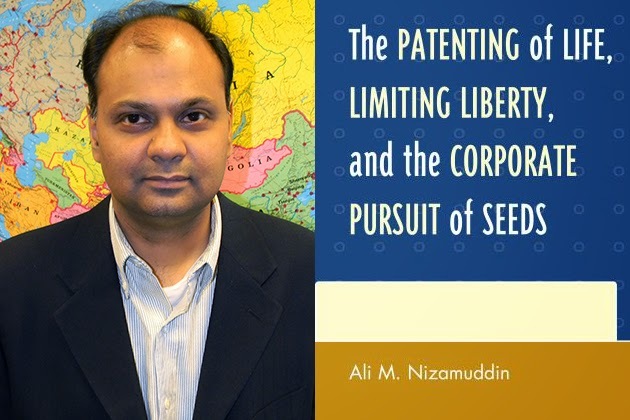 Ali Nizamuddin, associate professor of Political Science at the University of Illinois Springfield, has published a new book entitled The Patenting of Life, Limiting Liberty, and the Corporate Pursuit of Seeds. The book investigates the corporate dominance of the world’s seed supply. The seed is nature’s gift and the first link in the food chain. This life form is becoming the exclusive intellectual property of the corporation. The advent of genetically modified seeds and strict patent protection accorded to them enable companies to own the seed even after the farmer has bought, planted, and harvested the seed. Nizamuddin explores how multinational corporations have a monopoly control over seeds and the accompanying pesticides which is leading to monocultures in the food system and the disappearance of traditional methods of farming. Local producers are forced to buy seeds each year, thereby fostering a feudalistic relationship of perpetual dependence. An imbalance of power has emerged and farmers are transformed from producers to consumers by these new arrangements. The leap to embrace biotechnology and genetically modified foods has been quite swift and conducted without the public’s knowledge. The food that our stomachs ingest may be increasingly bad for us. Case studies from four developing countries are presented for consideration. The book was published by Lexington Books, an import of Rowman & Littlefield, and is available for purchase online. For more information, contact Ali Nizamuddin at 217/206-8424 or aniza2@uis.edu.